Publisher's Note: Products purchased from Third Party sellers are not guaranteed by the publisher for quality, authenticity, or access to any online entitlements included with the product. 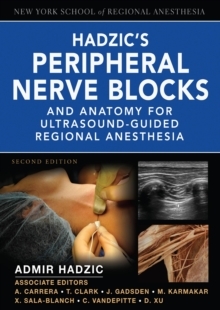 The complete, authoritative, and practical guide to nerve blocks -- with a comprehensive atlas of ultrasound anatomyIncludes DVD with detailed instruction on ultrasound-guided nerve blocksHadzic's Peripheral Nerve Blocks takes you step-by-step through traditional and ultrasound-guided nerve block techniques. The second edition places an emphasis on clarity, standardization, and safety of peripheral nerve block techniques. 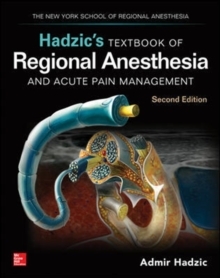 Featuring sections that progress from the foundations of regional anesthesia to the clinical applications of nerve blocks, Hadzic's includes tips and insider perspective from the leadership of The New York School of Regional Anesthesia and its academic affiliates. 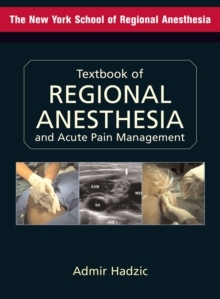 The book also includes a unique atlas of ultrasound anatomy for regional anesthesia and pain medicine. FEATURES:A real-world emphasis on clinical utility serves as the underpinning of chapter content and drives the book's in-depth explanations of techniques and proceduresOutstanding organization begins with the foundations of peripheral nerve blocks (e.g., regional anesthesia, equipment, and monitoring and documentation) and then reviews clinical applications for both traditional procedures and ultrasound-guided proceduresNEW! Substantially expanded number of nerve block techniques, including both basic and advanced blocksNEW! Anatomy and practical considerations for ultrasound-guided spinal, epidural and paravertebral blocks NEW! Atlas of surface anatomy, to better identify the surface landmarks NEW! Atlas of ultrasound-guided anatomy, designed to provide critical contextual detail for the preceding technique-related content NEW! Step-by-step standardized monitoring and documentation of the block proceduresNEW! Decision-making algorithm integrating techniques and technology to improve the success and safety of nerve block proceduresNEW! Section on imaging of the neuraxial spaceNEW! DVD with detailed instructions on 5 ultrasound-guided nerve blocks that cover 95% of all indications in clinical practiceNEW!